Who Qualifies For A Thank You Card? You can shop a wonderful range of thank you cards online. 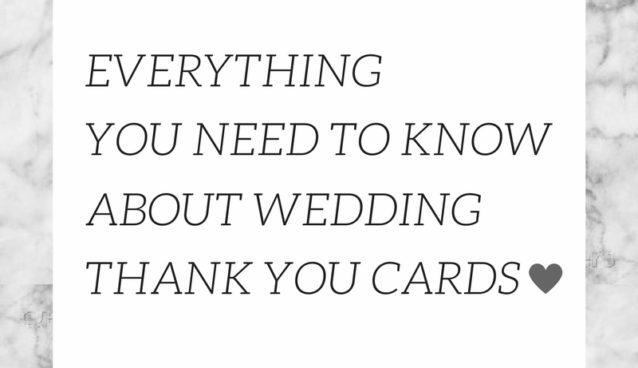 Everything You Need To Know About Wedding Thank You Cards – Do They Have To Be Handwritten? Of course they don’t HAVE to be handwritten however, handwritten thank-yous’ come across the best. In the crazy digital world we live in handwritten cards are appreciated even more so than ever! It takes 30 seconds to send a text message or an email. Whereas a handwritten card takes that little bit longer and really does add that extra magical personal touch. Traditional handwritten thank you cards are always a joy to open and appreciated that little bit more. As mentioned before, writing your thank you cards probably isn’t your idea of the perfect Saturday afternoon. Especially after spending a week on a nice exotic island somewhere surrounded by sun and rum. But it doesn’t have to be an uphill battle! Keeping organised during the planning process will really pay off at this moment in time. Before writing your thank you cards it’s probably a good idea to make a list of all of the gifts you received. Who they were from, and then another list of people who you want to send your wishes too. Creating a system is great way to tackle the task too. Set yourself a goal of writing ten cards a night for the next week, that way you can have 70 cards done in a week! Finally, the best tip we can give you would be to save the list that you made when you were giving Postman Pat a run for his money and dishing out all of your invitations. This way you have all of the names and addresses ready. Everything You Need To Know About Wedding Thank You Cards – When Are You Supposed To Send Your Wedding Thank You Cards? It’s probably best to start writing the cards as soon as you get back from your honeymoon. Or if you’re not having a honeymoon wait a couple of days and then start. This way the wedding is still fresh in your mind, making it easier to remember all of the small details. Here at Bride & Groom Direct, we normally recommend that you aim to have all of your cards posted three months after your wedding. Ideally, all of your cards should be sent out within a month. This gives you enough time to settle back in to reality and get scribbling! Everything You Need To Know About Wedding Thank You Cards – What Do I Write In My Thank You Cards? This is something that we can’t really tell you. There isn’t any set rules, or expectations, a thank you card is simply a short and sweet note from yourself and your partner. If somebody has sent you a gift then it’s nice if you can be specific. Mentioning the gift that you received from them is a nice little touch showing that you truly are thankful for the item. Another nice touch is making it personal. Thank you cards are pretty generic however, it can be nice to make them all slightly different. Whether this is mentioning their role in the wedding and how happy it made you. Or bringing up a time in the future when you may see them next. The beauty about weddings is – they are all different, just like people. It’s important to be yourself and incorporate your personality into the card. Sure, thank you cards are a formality, but if you wouldn’t use big fancy words and calligraphy handwriting usually don’t stress yourself out about it. The chances are the person receiving the card knows you very well and loves you the way you are, so why change that?